1. It is not hard to do. There are a couple of steps involved, but no special cooking skills are required. It is mostly “chop, saute, mix together and pop in the oven”. 2. It can also be customized easily: include or omit certain veggies; or make it vegetarian by skipping the sausage. It can even be modified to suit your picky eaters*! 3. It is bursting with flavors: the eggplant, herbs, the sausage connect in one hearty comfort casserole. I haven’t tried freezing it, but my guess is it will freeze fine. It would be a perfect addition to your freezer meal list if you have one (you can see mine here. Freezer meals optimize my life!). *Eggplant is known to absorb a lot of oil during cooking process. I found that microwaving it for about 5 minutes before cutting makes it less “spongy” and reduces the amount of oil needed for cooking. *You can increase the ratio of veggies to pasta to make it even lighter. *Go light on the cheese: good quality cheese goes a long way. 1. In a large pot cook orzo per package instructions, drain and set aside. 3. In a large skillet brown Italian sausage on medium-high heat, breaking it into small chunks, until no longer pink. Remove on a plate lined with a paper towel. 4. Drain/wipe the skillet. Add canola oil and brown the eggplant for about 5-7 minutes. You want nice caramelization on it for maximum flavor. Add the herbs and the red pepper flakes once the eggplant starts getting some color. Remove the eggplant to the pot with the orzo. 5. To the skillet add the rest of the vegetables and saute on medium heat until tender, about 7 minutes, add garlic and saute another minute or two. Remove to the pot with orzo and eggplant. 6. Add the sausage, tomatoes and cheese to the pot and stir everything to combine. Add salt and pepper to taste. 7. Transfer the mixture to a 9×13 casserole dish, sprinkle with the 1/2 cup mozzarella and Parmesan cheese. Bake for 20 minutes covered with aluminum foil, and additional 10-15 minutes uncovered, until the cheese is melted/crispy. *Leave some orzo plain, or mixed with whatever vegetables your picky eater likes. Add this mixture to one side of the baking dish, put a strip of aluminum foil between this part of the dish and the rest. What are your ways to accommodate picky eaters? Or if you don’t have picky eaters in your family– share your secret, I would love to know! 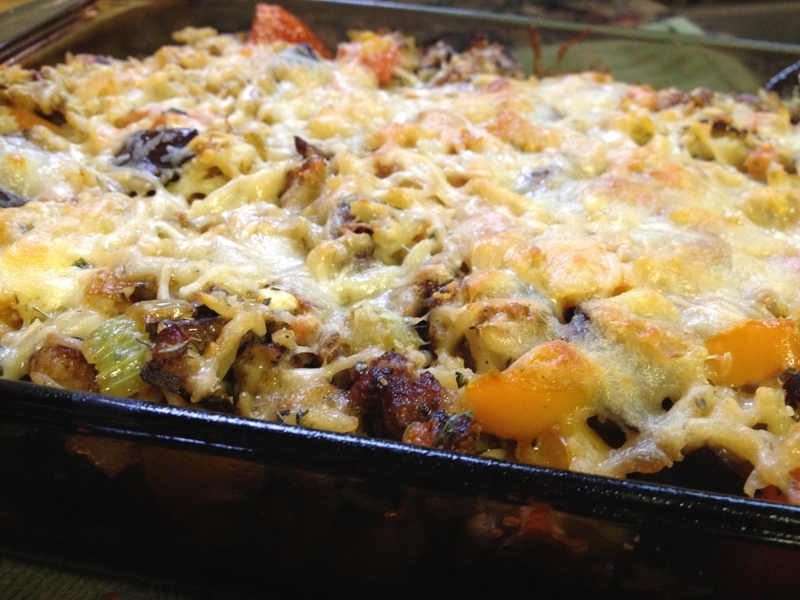 I hope you give it a try, Keri, it is a great comfort food dish! My 6-year old is very picky and one thing she wants is all of her food to be served separate, for example; potato on one plate, fish or meat on another plate and salad. She doesn’t eat ground meat, except in form of meat balls. Also, she doesn’t eat meat in her soup. If she gets a small piece of meat, shes done. Her favorite food that she will eat 3-4x a day, every day is cereal. I am very proud of her that she’s willing to try different foods though. I like this casserole spin on eggplan. Thank you for sharing your recipes with us! I think it is awesome that she tries new food! It is definitely an on-going process, and it takes so much patience! My son was very picky when he was younger but now at 11 he eats almost everything. I think it is typical for kids to prefer their food “not touching”, it is probably easier for them to understand and appreciate each part of the meal this way. Thanks for sharing your experience, Tanya! Mila, YUM! I love eggplant, and I would love to try this recipe. I’d have to leave some orzo and sausage on the side for my somewhat picky teenager (who won’t eat eggplant, even though he loved it when he was 5). Pinning this! Please link this up on Friday at Best of the Weekend! Hi Amy, kids are funny like that. 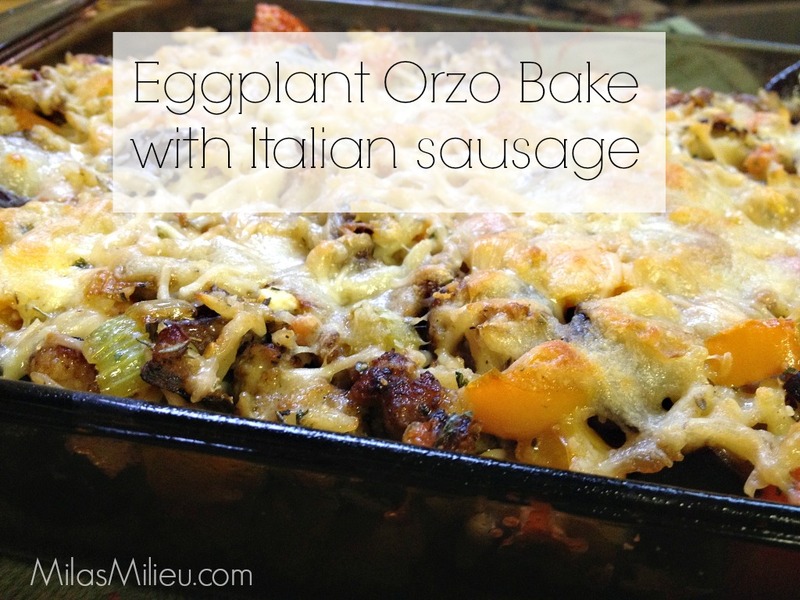 It is easy to leave out the eggplant for a portion of this casserole and just add the no-eggplant orzo to a corner of the baking dish. No separate preparation required! Thanks for the pin! I will definitely join your party–it is fun, thanks for inviting me! It will be great for that, hope you try it! I’m so glad you shared this on Best of the Weekend, Mila! Hi, I found you via the Marvelous Monday link party. This looks absolutely delish. My Italian MIL does a similar eggplant dish and it’s to die for! Will be trying this one out. Hi Marianne, thanks for stopping by. I hope you like it! Hi Mila, just letting you know I am featuring this recipe at Best of the Weekend tonight! Thank you Amy, that made my morning:) We love that dish around here! Hi Mila, finally getting around to making this. Questions: Eggplant microwaved for 5 minutes (it says seconds in your recipe) — is that with skin on or off? Skin on, just prick it in a couple of places. Depending on the size, your eggplant may take less than 5 min, maybe check after 3 min?